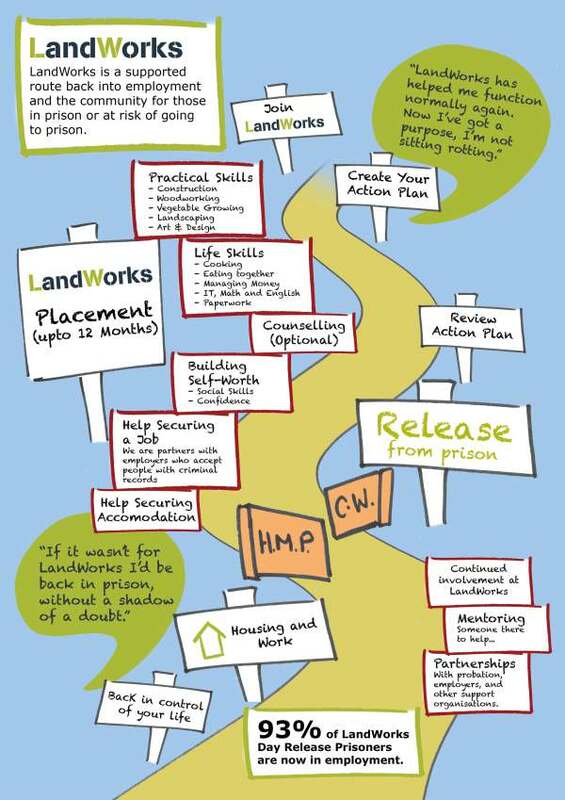 LandWorks is an independent charity providing a supported route back into the community for current and ex-prisoners. Based on the vibrant Dartington estate, work-based training goes hand-in-hand with developing life and social skills. Through being involved in a positive and non-judgemental workplace, trainees develop responsibility, self-belief and confidence. On release from prison an offender is leaving a very structured environment in which they had virtually no control over any aspect of their life. Returning to the community, offenders are confronted by a host of difficult decisions – from who to associate with, to how to get a job. The LandWorks project is a six-month opportunity for up to eight offenders to become used to work practice, gather relevant training and work skills, build self worth, confidence and start to take responsibility. As a trainee at LandWorks they can start to take part in the community, become work ready and go on to employment.